I am relieved to find out that I passed my ACMG Assistant Alpine Guide exam. The exam took place from August 23 to 31 here in the Canadian Rockies. It was an intense 9 days of being evaluated on your guiding technique under the watchful eyes of the examiners. During the exam, I received positive feedback upon the completion of each day but there is nothing like two weeks of nail biting waiting for the official results to erode ones confidence. I have been focusing towards this for the last year and half completing 7 courses and exams in 15 months. This summer alone, I trained hard in the hills climbing over 30 alpine routes in preparation. Now I can work and be insured to guide waterfall ice, mixed climbing and mountaineering; essentially get paid to do what I love doing. The next step is taking the full alpine exam in 2 years after working as an apprentice guide for a couple seasons. 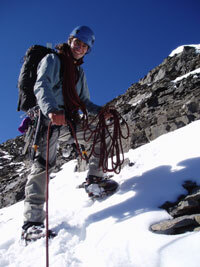 Then of course, there is a skiing side of things in order to complete the international mountain guide certification. It's a long road but extremely gratifying so far.